long time no monday post! this post is late because i haven't been home, but better late than never right? 1. the first highlight since the last post has to be getting through exams this semester. this has literally been the hardest semester yet, even though i've done five papers three other semesters before this. even though i was doing four papers this semester, i took on a lot more work shifts, and trying to find a perfect work/uni/life balance was super hard. i'm glad this semester is behind me now! 3. i. found. my. size. in. nike. roshes. can i just explain how hard it is to find a size six in these shoes?! i didn't even get my first pick (i wanted the black and white classic ones) but i'm so so happy with these ones!!! 4. the other day, a friend of mine told me she was following my cheer me up monday posts and asked me where my recent post was. it was such a pleasant surprise to actually know and get told that i have people looking forward to these posts!!!! 5. after working five days in a row, i got two days off to hang out with some close friends! what a nice break. we had a movie night where we ate all. the. time. 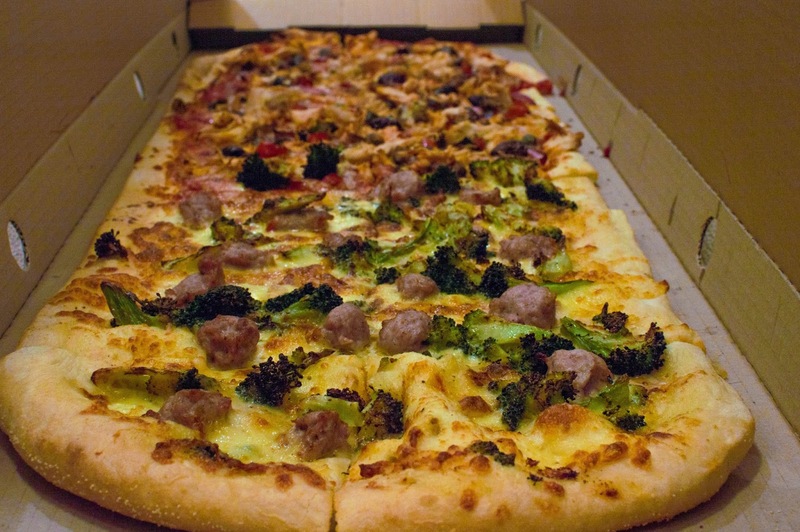 i finally got to try out the one metre long pizzas from toto's. yum!!! 6. the last time i had a cheer me up monday post was before i took my restricted driving test. i was really reluctant to tell anyone about my test just because so many people have failed the new restricted testing! luckily i had the nicest instructor and passed me! hooray! 7. 22 jump street. that is all. 8. finding out about this cute little store. 10. since holidays began, i've started reading again! re-reading one of my childhood loves: harry potter. also this buzzfeed page explaining the importance of reading the harry potter books as well as watching the movies. see you all next monday when i'll be in queenstown!!!! and YAY! QUEENSTOWN! this is not your first time right?? it's so pretty there! miss the scenery! i wish i could actually try some of your baking!!! it looks way too good! thank thank thank you :3 it is indeed my first time and i'm so excited!!!!! !